Cover the grapes with boiling water for 3 minutes, drain and peel. Halve the grapes and, if necessary, remove their seeds. Set aside. Preheat the oven to 100°C, gas mark ¼. Put the stock in a wide pan, bring to the boil and leave it to boil until reduced by 3/4 (about 15 minutes). Meanwhile, divide 6 tbsp of the oil between 2 non-stick frying pans over medium-high heat. Season the chicken and put, skin-side down, in the pans. Fry for 5 minutes, then turn over and fry for 10 minutes or until cooked. Transfer to a plate, cover loosely with foil and keep warm in the oven. Leave one pan on a low heat, add 1 tbsp olive oil and stir in the shallots and celery. Fry for 4 minutes or until soft. Add the dessert wine and boil until it has reduced to a glaze at the bottom of the pan. Add the shallot and wine mixture to the reduced stock. Add the cream. Simmer for 15 minutes or until reduced to a rich sauce. Add the grapes, lemon juice and chives. 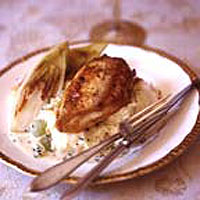 Serve with the chicken, with mashed potatoes and grilled chicory.